April | 2014 | VAMboozled! In January, I wrote a post about “An AZ Teacher’s Perspective on Her “Value-Added.” Valerie Strauss covered the same story in her The Answer Sheet blog for The Washington Post, validating for me that readers appreciate stories from the field that explain in better terms than I can what is actually happening as these VAM-based teacher accountability and evaluation systems are being “lived out” in practice. Well, the same AZ teacher wrote to me another story that I encourage you all to read, about the intersection and alignment of standards and their assessments, or more specifically the lack thereof. A fundamental principal in education is the precise alignment of the teaching of learning objectives (standards) with the assessment of learning objectives (tests). Research has demonstrated that when an educator plans lessons that begin with an analysis of what students need to learn, coupled with how a student will demonstrate the learning, achievement tends to happen. This is a “best practice” in education. Enter: standards’ reform. My school district saw the writing on the wall: Common Core implementation was going to be massive. Beyond a shift in the philosophical underpinnings of standards (college and career readiness vs. every state for themselves), Common Core implementation meant, in some cases, a shift in instructional approaches (inquiry vs. modeling). And frequently, Common Core implementation meant changes in what got taught and in which grade levels. Like any well-meaning, responsible school district, my district realized these changes were going to take time. And so they began Common Core implementation earlier than others in the 2012-2013 school year. And based on what we know about best practices, when the standards change, the assessments should change as well. But they didn’t—yet. For the past two years, I (and many, many others) have been teaching standards that are NOT fully aligned to the state assessment system. Instead, we’ve been frantically (and some may say schizophrenically!) trying to teach two sets of standards—the old (aligned with Arizona’s current state assessment) and the new Common Core. Enter: value-added measures. Value added measures are statistical tools aimed at capturing a teacher’s impact on student achievement through student performance on standardized tests. A few years ago, Arizona passed a law that mandates up to 50% of a teacher’s evaluation be comprised of student test scores. And again, my school district did what any responsible, law-abiding district would do: implement a teacher evaluation system that complies with state law: 50% of a teacher’s evaluation is composed of student test scores and 50% is composed of classroom observations. The intersection of these two policies is a problem for teachers (and students!). If the state assessment is not designed to precisely test the standards that are being taught, it cannot be legitimately claimed that value-added measures (or any other measure using student test scores!) are capturing a teacher’s impact on student achievement? One problem for teachers is that their employment status may hinge on the outcome. One problem for students is that what they are learning may not be what they are ultimately held accountable for on the state assessment. In this case, compliance with law has superseded the use of best practices. Let us hope this doesn’t happen in another field–say, healthcare? Since 2009, the US Department of Education via its Race to the Top initiative has given literally billions in federal, taxpayer funds to incentivize states to adopt its various educational policies, as based on many non-research-based or research-informed reforms. As pertinent here, the main “reform” being VAMs, with funding going to states that have them, are willing to adopt them, and are willing to use them for low- and preferably high-stakes decisions about teachers, schools, and districts. Diane Ravitch recently posted a piece about the Education Law Center finding that there was an interesting pattern to the distribution of Race to the Top grants. The Education Law Center, in an Education Justice article, found that the states and districts with the least fair and equitable state school finance systems were the states that won a large share of RTTT grants. Interesting, indeed, but not surprising. There is an underlying reason for this, as based on standard correlations anybody can run or calculate using state-level demographics and some basic descriptive statistics. In this case, correlational analyses reveal that state-level policies that rely at least in part on VAMs are indeed more common in states that allocate less money than the national average for schooling as compared to the nation. More specifically, they are more likely found in states in which yearly per pupil expenditures are lower than the national average (as demonstrated in the aforementioned post). They are more likely found in states in which students perform worse, or have lower relative percentages of “proficient” students as per the US’s (good) national test (i.e., the National Assessment of Educational Progress (NAEP). They are more likely found in states that have more centralized governments, rather than those with more powerful counties and districts as per local control. They are more likely to be found in more highly populated states and states with relatively larger populations of poor and racial and language minority students. And they are more likely to be found in red states in which residents predominantly vote for the Republican Party. All of these underlying correlations indeed explain why such policies are more popular, and accordingly adopted in certain states versus others. As well, these underlying correlations help to explain the correlation of interest as presented by the Education Law Center in its aforementioned Education Justice article. Indeed, these states disproportionally received Race to the Top funds as their political and other state-level demographics would have predicted them to, as these are the states most likely to climb on board the VAMwagon (noting that some states had already done so prior to Race to the Top and hence won first-round Race to the Top funds [e.g., Tennessee]). Please note, however, that with all imperfect correlations found in correlational research, there are outliers. In this case, this would include blue states that adopt VAMs for consequential purposes (e.g., Colorado) or red states who continue to move relatively slower in terms of their VAM-based policies and initiatives (e.g., Texas, Arizona, and Mississippi). (Co)related again, this would also include states with relatively fewer and relatively more poor and minority students and English Language Learners (ELLs), respectively. What a victory for teachers in Tennessee! Especially given the TVAAS has been in place in the state since 1993, and Tennessee is the state with the longest running history using value-added (thanks to education “value-added” creator William Sanders). Although, again, it might be too soon to celebrate, as rumors have it that some of the other consequences tied to TVAAS output are still to be pushed forward. Rather, this might be viewed or interpreted as a symbolic gesture or compromise, to open up room for further compromising in the future. Accordingly, David Sevier, the Tennessee State Board’s Deputy Executive Director also noted that the Board of Education can “now begin to find a measure that is comparable to TVAAS that all parties can agree on.” While I’m not quite sure how to interpret what this means, though, in terms of whether they think it’s just the TVAAS that’s the problem in terms of evaluating their teachers (also for licensure purposes) and that another VAM can satisfy their needs and ideals, or not. Hopefully, the latter is true. To read more about this from the original article, click here. 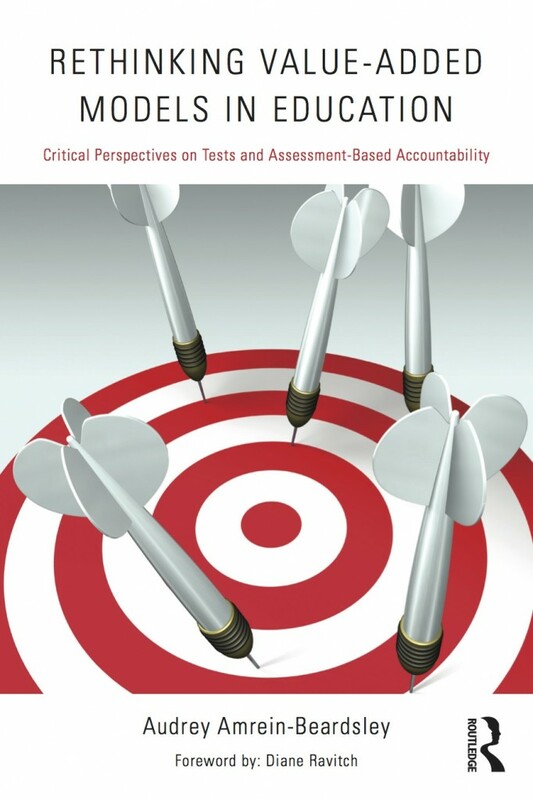 The book I spent all last year writing, titled “Rethinking Value-Added Models in Education: Critical Perspectives on Tests and Assessment-Based Accountability,” with its foreword written by Diane Ravitch (please see its cover below), is to be released by my publisher — Routledge — on May 4, 2014, although it is now available for pre-order. For those of you who are interested (and who have also inquired about this book’s release), you can (pre)order this book on Amazon, here, for $34.62 (free shipping, of course, on orders over $35); you can find it via Barnes & Noble, here, for $34.42; but you can also go directly to the Routledge site, here, and (pre)order it for $31.96 if you use the following 20% off discount code at checkout: IRK69. Just so everybody knows, though, I am donating all of my personal royalties to the ACODO Orphanage in Siem Reap, Cambodia. You can find out why I am doing this in the beginning of the book, where I explain how Cambodia relates to my take on VAMs. But on a more general note I have no financial interest in this. While I do care deeply about this topic, as evidenced herein with this blog, and I do feel like as a scholar I am fighting a good fight particularly against those who are not making very informed and/or research-based decisions when it comes to VAMs, I do have absolutely no interest in making any money off of the many (many of which are shameful) consequences coming about as a result of inappropriately attaching high-stakes consequences to, and/or making high-stakes decisions as based on VAMs. Below are some of the more specific details on the book, in case this information helps you make your decision to purchase, and of course read, and hopefully use widely, and if the situation calls for it, wildly! The Center for American “Progress:” Really?!? The American Statistical Association recently released a position statement on VAMs–a statement that really should/could serve as one of a few “nail in the coffin” reports on VAMs. Others, however, continue to move forward with VAMS despite this position statement and all of its surrounding research. That being said, the newest member to promote and push VAMs? The Center for American Progress. Progressive? Pioneering?? Advancing “new” policy ideas??? Not so fast!! According to a report they just released, here is exactly the progressive and pioneering policy ideas that they are advancing, summarized here specifically in terms of VAMs. They write: “[W]e know much more about the impact of high-quality teaching on student achievement” citing in their PDF their take on a bunch of “research” studies that, on this and other points throughout the paper, are based almost entirely on the mainly technical reports written by the US Department of Education, William Sanders (the developer of the EVAAS system), Doug Harris (a “cautious” but quite active proponent of VAMs), and Eric Hanushek (whose economic research is almost always cited when policy wonks are interested in advancing VAMs). Their research is notably a small subset of the actual research out there on VAMs, research that was used to rightfully construct the aforementioned position statement released by the ASA, and research that for decades has evidenced that teachers account for, or can be credited for, approximately 10% of the variance in student test scores, while the other 90% is typically due to factors outside of teachers’ control. Regardless, while the Center for American Progress briefly acknowledges this, they spin this into their solution: The reason this percentage is so low is because we have not yet been accounting for growth in student achievement over time; that is, via value-added models (VAMs). In other words, using more sophisticated models of measurements (i.e., VAMs) will help to illuminate the “real” results we know are out there, but simply have not been able to capture given our archaic models of measurement and teacher accountability. Yes, they are now available, but they have been both available and in use, particularly in the state of Tennessee, the state in which “the best” VAM has been available and in use since the early 1990s. Yet the state of Tennessee still has not evidenced much of anything, especially as per the intended consequences for which their (best) VAM has been tasked for more than two decades to do, at a hefty price of $1.7 million per year I might add. See a recent summary about this here. And it goes on, including recommendations for attaching consequential decisions to VAM estimates…Read more, or not. Unfortunately, this reminds me of the Saturday Night Live skit, “REALLY?! ?” with Seth and Amy that has has repeatedly given viewers a “hilarious, sarcastic look” at some of the biggest issues in American news. Unfortunately, this skit is not nearly as comedic or laughable. Just this week, P. L. Thomas, an Associate Professor at Furman University, wrote a very good piece about VAMs, some of their philosophical and historical underpinnings, and some of the recent studies/papers released about VAMs including the recent American Statistical Association (ASA) Position Statement (reviewed in this blog here and just yesterday here), the recent work of Edward Heartel (covered in this blog here, here, and here), some of the wisdom of Rutgers Professor Bruce Baker (mentioned in this blog here and here), and the outstanding, I mean outlandish, Chetty et al. study (covered in this blog here and here). Thanks to my former colleague for sending this along! Anyhow, here is the direct link to the actual post, although I have also re-posted the initial piece below, especially for those of you reading via your handheld’s and/or emails. Do visit the actual post, though, and perhaps follow his blog, as a quick perusal of the blog’s content will likely evidence that there is some other good content herein.